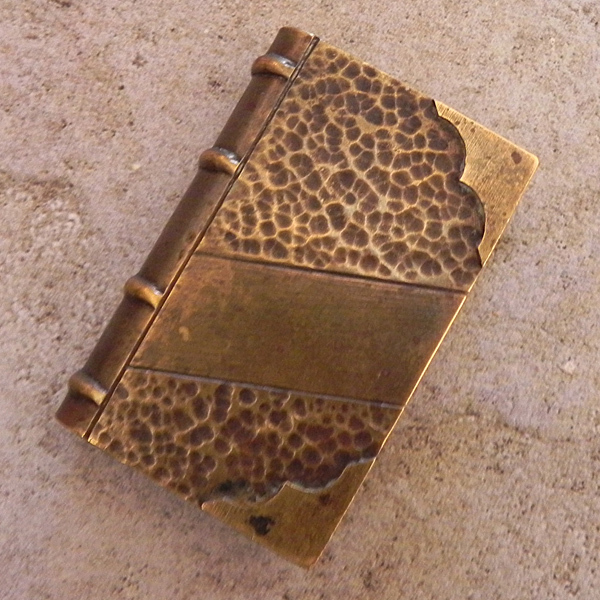 I think artifacts related to the book arts, fall into three categories. (1) Objects that don’t resemble books at all but are important, (2) Curiosities that look like books, but aren’t, and (3) Those items which aren’t necessarily art, but are books. All are historically interesting if not intriguing. As an avid antique hunter/gatherer, I am always scanning antique shops, estate sales, and antique shows for anything that falls into those three categories, usually without any clear idea of what I am looking for. In other words, I will know it when I find it. Unless of course it falls into the first category, in which case I had been looking for this particular item for some time. It had haunted my dreams ever since I had found it unobtrusively sitting on a counter in the back of an antique shop on Antique Row in Tacoma, Washington. 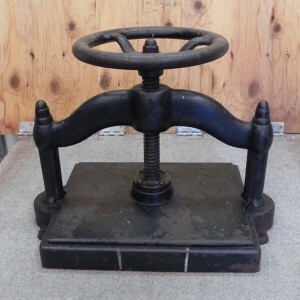 Two months later, I walked out with my own 19th century cast iron book press which I subsequently found out was actually an antique copy machine which is now used by book artists worldwide as a book press. Recycling can refer to more than just separating paper from glass. At any rate, it now sits proudly in my studio happily pressing books as if it had its own personality, which of course, it does. In Irving Stone’s The Agony and the Ecstasy, one of Michelangelo’s friends states, “It’s the hunt that matters.” I prefer to think it’s more enjoyable to find something when you are not searching for anything at all. Something beckons from across the room, it’s brassy patina glinting in the dim light as it lies on a dresser almost hidden in the chaos of other items that have been placed out for an estate sale. Holding it in my hand, I know it is meant for me; A brass paperweight in the shape of a book. I had never known one existed, so how could I have been searching for one? Antique Shows are different. The hunt is on. I enter the glass doors of the pavilion at the Puyallup fairgrounds with the knowledge, I will walk out with something. I just don’t know what it will be. I pass on the 19th century, sterling silver, mechanical pencil for $100. I open countless volumes of 19th and early 20th century children’s stories, not finding anything that really catches my eye. I have filed a few possible items to memory but have found nothing that floats my boat so to say. Is it possible that I will find nothing at all? Oh, the horrors! On one of the last tables, a small book beckons. 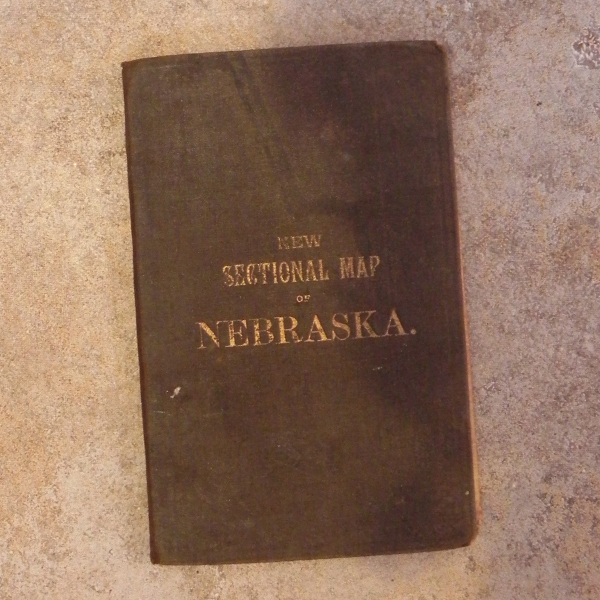 In gilded letters, it says, New Sectional Map of Nebraska, my old stomping grounds. Franklin B Marsh is inscribed on the inside front cover, proclaiming ownership. 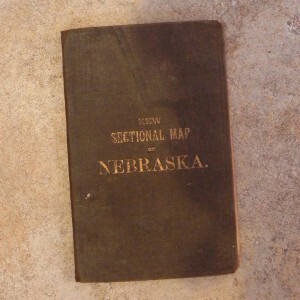 The book was printed by the State Journal Company in 1885 with a small index of county populations measured by the 1885 census. Yes, there really was a census in 1885. The map folds out to measure approximately 23″ x 40″ and folds back up into the hardcover book measuring 6″x 4″. My heart sinks when I see there is no price as I think of the old adage, if you have to ask, you probably can’t afford it. The proprietor turns to me as I hold up my find. Hmm….he says. I’ll let you have it for a buck. I pull a crumpled dollar bill out of my wallet and hand it to him.